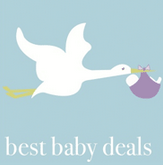 Check out this week’s Best Baby deals for some of your favorite stores. Not as many deals on wipes this week, but make sure to stock up on diapers and food while on sale! For expectant moms: Don’t forget that you can also create an Amazon baby registry right now and be entered to win an Amazon gift card!. Plus you will get 10% off your entire order to help you complete your registry closer to your due date. If you want cloth diapers, be sure to check out the current Jungle Roo cloth diaper and wet bag sale on Zulily! The sale ends 8/20.